Briefly during the summer of 1960, Louis Zemel proposed building a ski area on West Rock Ridge in New Haven, perhaps south of the Wilbur Cross Parkway and West Rock Tunnel (Heroes Tunnel). The ski area may have had a vertical drop of 350 feet. Multiple lifts were to have been constructed, along with a base lodge and ski shop. The $150,000 project was to also include snowmaking. Likely rejected by the New Haven Park Commission, Zemel would end up co-founding Powder Hill ski area in Middlefield later in 1960. 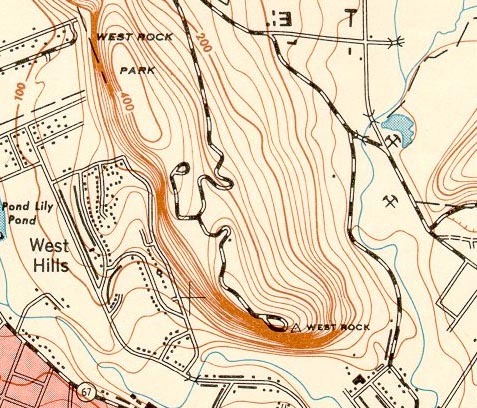 There are no known remains of the proposed West Rock ski area. It is not known if it was related to the New Haven Tow.
" A Woodbridge man has proposed building a $150,000 ski run on nearby West Rock in New Haven. " " Zemel told the New Haven Park Commission that his venture would provide a first class ski area, complete with lifts, a snow making machine, ski shop, and refreshment stand. " "West Rock Proposed For Ski Run" Meriden Journal. 27 July 1960. "City Turned Down West Peak Ski Tow" Meriden Journal. 28 July 1960.